The back triangle stance, for instance, in the posture of right hammi, forms a triangle alongside the outside of the right foot with the inside of the left foot. The founder called this stance hito e mi. 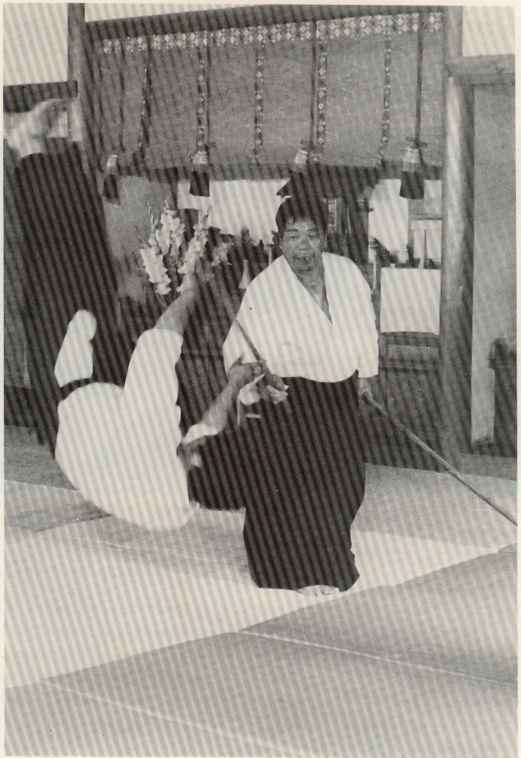 When standing in hito e mi, it is possible to execute a strike or thrust without receiving a blow in return. In Aikido, the second concept, the harmonizing of ki, has many possibilities. In practice, one tries always to blend one's ki with that of the attacker. This enables one to respond in a less severe manner, without thrusting or striking, even when it is possible to do so. Partner blending practices such as kumi-jo and kumi-tachi are done according to basic forms and their purpose is the development of harmony of ki. After basic techniques have been learned, applied techniques can be par-formed at any required time. However, some people feel that for the purpose of testing techniques it would be necessary to have a match of some sort. This is very dangerous because, in Aikido a contest means a fight with a real sword. If a contest is held, rules must be made. The dangerous techniques would not be allowed and the range of applied techniques would be limited. Such a restriction would make the true aims of Aikido difficult to understand and Aikido would become a sport. The more present day Budo seeks a real peace and proves the spirit of universal love, the more severe the process should be to attain these goals. That is the world of Budo. Progress along the way (Do) is one of hardship resulting in everlasting joy and cherished human relationships. These are special rights given to students, and it is the duty of the student to accept the hardships of ken, jo and taijutsu practice to actively further himself along the way. 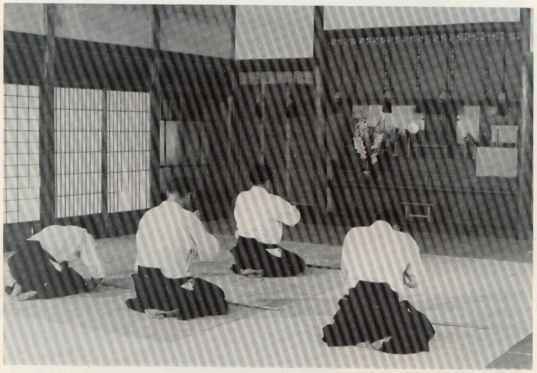 To understand the combined Aikido system is to realize that one is not dependent upon a ken, jo, or other weapon. Development of mind, body, and technique does not rely upon an armory, but on independence of action. If a sword is used, do not realize it as a sword, If using a jo, do not depend on it, but feel the common harmony in movement. The system of ken, jo, and taijutsu are explained through the photographs. Their common features can be seen by careful examination. This proves the adaptability of Aikido to any situation. True understanding comes only through study and practice. 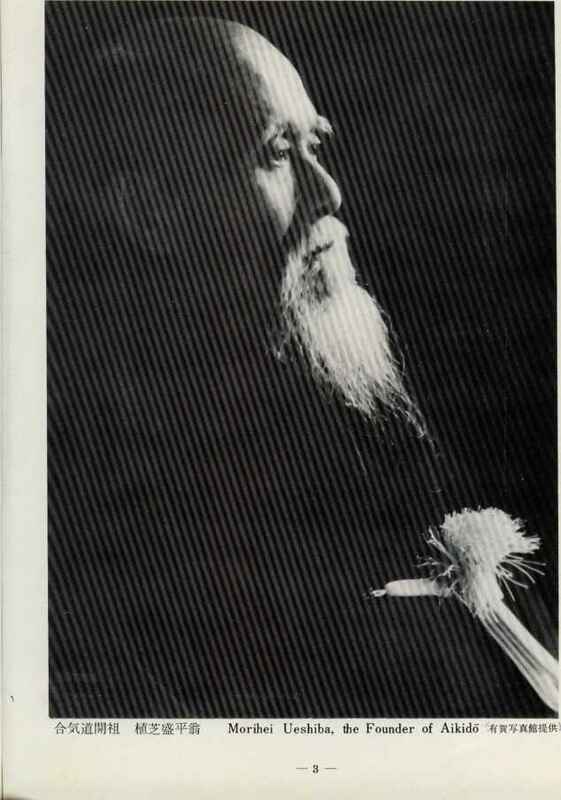 It should be the desire of all who practice Aikido to develop ki, body, and mind without neglecting daily practice. In this way, one can develop the true Aikido Spirit.